WordCamp Pune and withdrawal symptoms! Posted byAditya Kane	 September 11, 2015 10 Comments on WordCamp Pune and withdrawal symptoms! WordCamp Pune is done! I am having withdrawal symptoms. I would love to write a lot of things about WordCamp Pune but it would be fair to say, that since it took place last weekend, I am still high on #WCPune koolaid. This is not a WordCamp critique. I am not writing about awesome sessions. I am not writing about what a WordCamp should be or not be about. I am writing a good snapshot of my experiences at this WordCamp. So someday I can go back and read through the entire two-three days of magic that is called WordCamps. WordCamp for me started a week before. I work remotely from Mumbai for rtCamp which is based in Pune. So I planned a full week in Pune that would end with WordCamp. Glad I did that! A lot of the volunteers, organisers and even speakers were good friends of mine. I was a speaker at this WordCamp too. So as we came closer to the weekend, I was filled with excitement. An example of that is the tweet below. I had been talking to Mahangu Weerasinghe from Automattic for a while on Twitter and at times exchanged emails about work culture, FOSS culture and culture of South Asia in general. He was part of the Automattic team who flew down (should I say up since he flew northwards into India?) to Pune for the WordCamp. Mahangu along with Jeremy Herve and Aminul Sajib (Aminul is shy and quite, but writes really well at this blog) visited our office on Friday. While they visited rtCamp, I think Jeremy might have been most amused with the local culture and customs. He was game enough to try out new food and ended up eating Pithla- Bhakari for lunch. After somemore chat about work culture and ISPs in India, Automatticians left rtCamp (hopefully with fond memories) to co-work at their hotel. I left on time, well I could have left earlier but I thought maybe being a Saturday there would not be too much traffic. Was I right? I reached ThoughtWorks office where the Foundation Day for WordCamp Pune was being conducted! These were mainly workshops for people new to WordPress but people not new to WordPress would also enjoy. I must say the ThoughtWorks guys are really cool. I found their entire staff polite, thoughtful and friendly. This I encountered with everyone from their security guards to the folks who were co-ordinating with WordCamp organisers. Here is tweet by Praveen (from Woo and now Automattic) at ThoughtWorks office. After a few sessions of WordPress fun in the morning, Mahangu asked where we could see some interesting places around. I recommended Aga Khan Palace. Actually, I recommended the palace for two reasons. One. Mahatma Gandhi was under house arrest at Aga Khan Palace and his wife died while they were held at the palace. His secretary too died in Pune. It would be easy for anyone to relate to Gandhi’s history as just about everyone in the world knows about Mahatma Gandhi. Two. Because I too wanted to visit this place for a long time. I had gone there as a kid but did not really remember much. Luckily, the place was nearby and Mahangu and Jeremy were hopefully happy to have visited Aga Khan Palace along with me. I added some historical context to some things for Mahangu and Jeremy. One funny yet slightly embarrassing incident at Aga Khan Palace was that the tickets are priced differently for Indians and non-Indians. I knew this was an Indian tradition for sorts at tourist places. Mahangu hinted that it is often the same in Sri Lanka. I joked to them that they charge more to non-Indians as part a colonisation tax. That said, it was very humbling to visit this place and walk the same hallways through which Mahatma Gandhi and many other luminaries of the freedom struggle did. Gandhi’s wife, Kasturba died at the Aga Khan Palace and it has her Samadhi. Samadhi is a sort of a memorial. It was simple, peaceful and sober just like it should have been. The trip to Aga Khan palace was something I was happy to do. 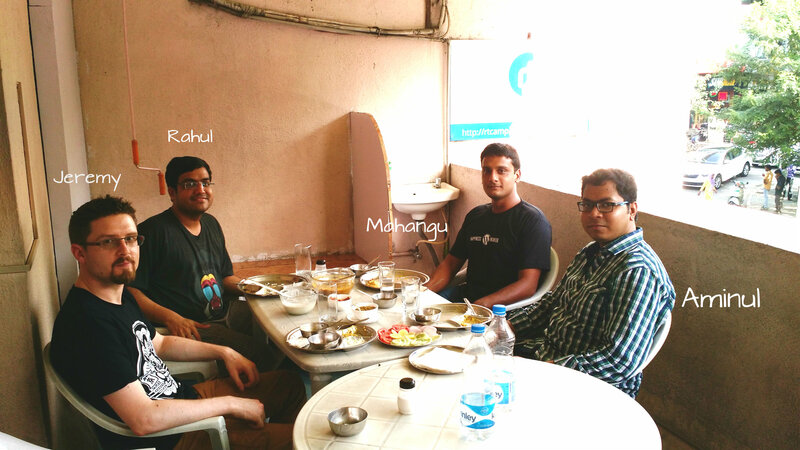 I am not sure how much it added to the experience of Pune for Mahangu and Jeremy, but I hope it did a little bit atleast. After the history tour of sorts, we made our way back to the Hotel where Mahangu and Jeremy were staying. Aminul and Rahul joined us at the Hotel and we made our way to a nearby pub. It was happy hours (I think!) and the five of us had Brun-Kheema and Beer! This pub is called the “Hidden Place”. Aminul has some interesting things to say about finding the Hidden place. After some beer and some more – Rahul and I headed back to rtCamp office and did some work. Actually he worked, I caught up with some emails. Then in the evening we went shopping with Topher DeRossia. He is of HeroPress fame. Topher was extremely humble about the fact that the HeroPress community had sent him all the way to Pune. I think he as bit shy and a little overwhelmed with his first trip to India. Actually later I found out that it was his first trip outside North America. I was invited for the speaker dinner as I was part of a panel discussion that was planned. I met far too many cool people at the dinner to list them down here one by one. Sunday arrived and I quickly travelled around 8 am to Modern College which was the venue for WordCamp Pune. As rtCamp were sponsors, I got busy with some colleagues setting up our sponsor table. The sponsor tables outside the auditorium were an awesome hit. Many walked upto these sponsors and started discussions, conversations which were a great deal of fun. It is always a great privilege to talk to people about your work, about open-source and WordPress by extension (something I will write more about towards the end of this post). Though at the selfie booth Alex and I got ourselves some new headgear. I won’t talk about WordCamp Pune’s multi-tracks. It can be confusing sometime and some good natured fun was had at the overlapping sessions. The organisers were fantastic. Some of them were my colleagues and ex-colleagues. Some I did not know as well before WordCamp. Organisers like Sheeba, Premanshu, Ganesh and countless other volunteers were simply awesome. The numbers overwhelmed them a bit but they kept slogging at it with a smile and always making everyone feel very welcomed. Remember these are people whose jobs are NOT to organise events, they are doing this often for the first time in their lives and often it’s thankless work. I am glad that some of us who volunteered in Mumbai saw some stress points and joined in moving stuff and microphones around at times without being asked or waiting to be asked. This is how it should be at a WordCamps. When you see a hassled organiser (belive me all of them are ) ask them if you can help out with something, direct traffic in certain directions, or just help move stuff from one place to another. So thanks again all of you guys who made WordCamp Pune possible. I am incredibly shy as a person. I am very inward looking and don’t really like standing on a soapbox except when I am blogging I guess. But thanks to Saurabh Shukla, who suggested I moderate a panel discussion, I ended up speaking with a microphone in front of thousands of people. No, in reality there were just over over 150 but it felt like thousands :-D.
I overcame my fear of public speaking a big deal. That was enough of a personal takeaway for me. Thank you for this Saurabh! I am privileged to work with a company like rtCamp and work in the WordPress ecosystem. I am not really the best geek around or the best mind around for that matter at these places. I have been lucky at times to be in the right place at the right time and with the right people. Much of it is just plain dumb luck. So really talking about how products are built, services function, talking about career options to students and just out of college kids is really nothing short of a great privilege. Also every conversation has the potential to teach you something new if you really open yourself to it. After party and back home! I had a great time catching up with the organisers again at the after-party. There was drinking and merriment and posing for photos all over. Early on Monday morning, I travelled back to Mumbai with Sanat and Sahil. Now I am having WordCamp withdrawal symptoms. This happens every time there is a WordCamp but I am happy in the knowledge that I will be part of another one soon in Mumbai. And yes, it was great being around you for these few days. I loved having your insights on so many things, it was interesting and useful to get your anecdotes and stories, whether when talking about food at rtCamp, when visiting the Aga Khan Palace, or in numerous other occasions during the weekend. Thanks for the nice play on word! It was great hanging out with you on Friday and other numerous occasions. Hope you run into you at somewhere or sometime, may be at a WordCamp again in the future. Nice writeup !! Yes, I could sense a bit of your shyness during the panel moderation but yeah.. you managed it really really well !! The panel discussion was fantastic and you spoke very nicely. Looking forward to attend WordCamps in future. Thanks for your nice words and encouragement. Yes, you should attend all WordCamps that possibly can. It is just an amazing experience. Its nice to see you share your experience at WordCamp Pune. It was my first WordCamp as a Organiser and as a Attendee, and I must say it was a great learning experience, but there is always a scope for improvement. We will always be grateful for all that you have done to help us at WCPune, really appreciate it. looking forward for WordCamp Mumbai 2016. I’m yet to write up my experience as I’ve got a lot of catching up to do at work. The weeks leading up to the India travel were really exhausting and frustrating. But in the end, I’m glad that it all worked out. I happened to have missed the day before WordCamp, though. That’s the only regret I have now. Don’t know where that evil pain in the neck came from! Hehe. The after party photos were quite sober. A lot of people were tired and simply sitting around eating and having a couple of beers more than “actually partying” – Too bad you guys had to take the plan back the same day and missed it.